One common issue people have, especially in urban areas, is a lack of storage space in their small bedrooms. A solution that most people don’t know exists but is obvious once you think about it is using the mattress foundation for storage. Now that boxsprings no longer use actual springs in them (despite the name), that space can be put to good use. Enter the Sto-A-Way storage foundation by Seahawk Designs. This foundation basically replaces your regular boxspring. So, instead of going out and spending $200-$300 on a boxspring foundation, you can upgrade to this for a few hundred extra and get extra storage space or eliminate the need for one of your dressers. The queen sized foundation has the same storage space as a regular 6 drawer dresser (7.5 cubic feet). It can come in any size, including a split queen. The foundation comes with a 10 year warranty, so it’s designed to last. The drawers use dovetail joints (considered the strongest joints) to keep from falling apart. This is not cheaply made. It also works with any mattress, so your mattress warranty remains intact. This works with any regular metal frame or even directly on the floor if you prefer. This does NOT work on beds with tall side rails, as the rails will block the doors from opening. I recommend this product to all of my readers who can afford it. It’s a great way to utilize space, especially in areas like Boston or New York City (or any number of other big cities) in which space is at a premium. But even if you live in a huge house, more space is not a bad thing. If you’re scraping for a way to squeeze more storage space out of your bedroom, this is one of the most efficient ways to do it. You get a long-lasting durable mattress foundation and storage space all in one. You can purchase the Sto-a-way foundation here from Amazon. Hello I am so delighted I found your site, I really found you by error, while I was browsing on Askjeeve for something else, Anyhow I am here now and would just like to say many thanks for a remarkable post and a all round interesting blog (I also love the theme/design), I don't have time to read through it all at the moment but I have book-marked it and also added in your RSS feeds, so when I have time I will be back to read much more, Please do keep up the fantastic work. I have since switched my link to Wayfair, which I believe has a much better track record at customer service. That's not twin. I don't know what size that is, but a twin is 38.5 inches across or so, give or take half an inch. I once saw a 33 inch mattress for a cot, but even that's not 34 inches, and it wasn't designed to come with a boxspring. We're looking for twin box spring size 34' or 34 1/2" x 74" or 74 1/2". Do you know how we can find this size box spring for twin beds? 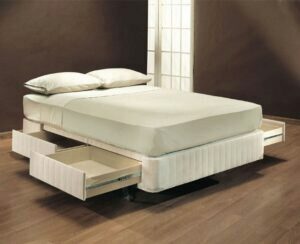 The beds are solid wood so there is very little flexibility with sizes. Thanks for letting me know. Olejo wouldn't have anything to do with Amazon. They're competitors. Amazon just has 4 different pages for the same product, and it looks like they merged that one into another one. I updated the link. Yes, the headboard would attach to the metal frame, and this foundations sits on a metal frame. (Metal frame not included... they generally go for about $50-$150 depending on quality). hey there! Considering trading in my 4 year old tempur pedic cloud thingy for a leesa and this guy. I'm wondering if you can put a headboard with this? I have no idea, we have a rooms to go furniture set and I've never had anything different. Thanks! Thanks for the heads up. I didn't have any experience with them, but I couldn't find any other nationwide company that sold it. I bought my Sto-A-Way from Sleepy's, but they're only on the east coast. Amazon sells it, but they just drop it off at your door step. Hopefully they get it to you soon. Just a heads up. I ordered this from Olejo on the recommendation here, and the customer service has been horrible. I still leave yet to receive it despite assurances it was supposed to have been shipped weeks ago. I went online and found numerous websites with a ton of similar complaints about this company so you may want to think twice about recommending that people buy from them. The product seems great and I am sure I will enjoy it if/when it actually arrives., assuming it is the correct item and not damaged. Yeah, I tried providing a second link to a place that might have it elsewhere. It's a neat product, but not everybody sells it yet.